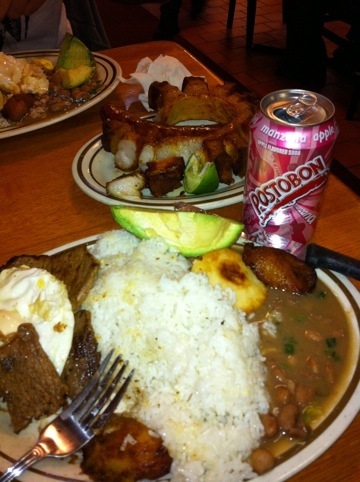 I was first introduced to Colombian food in North Carolina at my friend Laura’s house way back in middle school. I absolutely loved “manzana”, (apple soda) and could not get enough of it! Problem was, I had no idea where to get it besides Laura’s house, so that was pretty much the only time I ever had it. As life continued, I moved to NJ, Laura made her way to DC and manzana slowly began to slip my memory. It wasn’t until I started dating Danny and he brought me to Noches de Colombia in Englewood, NJ that I was reunited with my obsession from the past. 🙂 Not only did the restaurant offer the apple soda, but an amazing variety of authentic Colombian food. I had never seen anything like it! This is a picture of…heaven. 😉 Kidding, it is a picture of Bandeja Paisa, a Typical Colombian meal that consists of carne (meat), plantains, frijoles (beans), juevos (eggs), avacado and chicharrones. I did what I could with the translations! This is definitely one of my new favorite meals and I love that I have friends that can introduce me to new foods that I might have otherwise never tried! Now it is your turn to try something new and go check out Noches de Colombia!